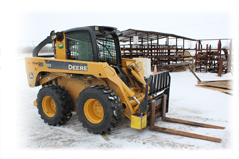 FOOTHILLS EQUIPMENT LIQUIDATION CO. LTD. is a company whose entire focus has and always will be to provide dedicated service to our clients, both the buyer and the seller. Incorporated in 1984, we have offered honesty and integrity with every auction, liquidation, appraisal or consulting service conducted. Put our proven track record and experience to work for you! If you are thinking of an auction, be it from heavy equipment to office furniture or anything in between, don't hesitate to call any one of our experienced staff for information. With their combined appraisal & auction experience they have proven to be one of the most respected teams in the industry. While you are here please roam about our site, view the Current Auctions, learn about our Absentee Bid System, and see what is available through Liquidation at this time. successful Foothills Auction is only a phone call away!"